Former WBO lightheavy and WBC cruiser champ Zsolt Erdei, 33-1 (18), will return to the ring for the last time March 8 in Kecskemet (Hungary) for a farewell fight. Erdei will be fighting for the WBO Euro lightheavy title. Erdei’s last years in boxing have been plagued by long injury layoffs. Erdei, promoted by Universum, won the WBO title back in 2004 and defended it 12 times and also won the WBC cruiser crown before dropping down to 175 again. 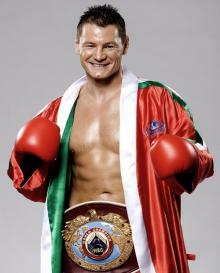 Supervising the WBO Euro title fight in Kecskemet will be another all time Hungarian great in Istvan "Koko" Kovacs.